While Going Solar, it’s an entirely new paradigm, so Sizing becomes very crucial part of the project as much as every component. If you are currently using a 5hp submersible pump to get water from 100feet below the bore well, it is not important that Solar Water Pumping Will require exact 5hp pump. Don’t go with the formulae that I am running a 5hp motor so . my solar water pump requirement is 5hp.. Get your water consumption pattern sized up. Your irrigation water requirements depends on crops you are currently growing, you may grow in future, and your soil type and soil moisture contents, and rain water availability. It’s a very complex calculation, so I wont go in details, but note, that there are many factors that play role in your irrigation water requirement. And your water pump should confirm to this needs. Take into account the free or nearly free power you are usually getting from government. Imagine a scenario where you spent say 10lacs for running a 10hp submersible pump. Now suppose you pumped daily with your old 10hp pump for almost 3 hours daily. now here your solar pump is capable of running from Sun Rise to Sunset…nonstop. So it is producing more water than you currently need it. you have to close the pump after 4 hours of pumping, you either have to build a tank, but how much water that tank will hold? For how many days, how huge will you make the tank? Now you realize that you really didn’t need the extra power. And you are not even able to use almost, all the free power that government provides. And there are limited options, here. Either to sell half of your solar panels at loss, or to move them to your home, where you could use that power for your home electricity needs. (4) You are not buying a USE and Throw item. You are investing for a minimum of 25years of power Security. Stuck with this important information, there are sooo many factors, very important factors that will come into play for deciding right solar panel for your need, your environment, your location, and your budget, and your farm.. There are also technical factors, that will be quiet important in choosing the right panel for your project. keep this in your mind, that you will not go with any solar panels or solar water pumping system providers, many businesses are in business simply to make money out of your aspiration, and very few are there who can guide you thoroughly on your project, who can Size up your water requirement for irrigation purpose and who will understand all your needs in Every possible scenario and details, and based on that will provide you a customized solution. You want a pair of clothes and you can buy in the market ready-made. It is not the same way with solar. Solar Radiation changes according to locations, seasons, times of days and with many other factors, so there is simply no ready-made thing here that you can pay and buy. 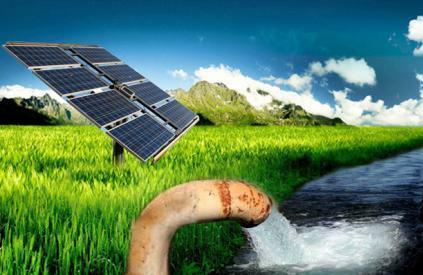 Customization is extremely important for not only solar water pumping system but any solar power project. The pump made for Gujarat will only be able to work at 70-80% capacity in Delhi. There simply is no ready made with Solar. The solar panels which are made for cold regions will not perform better in Desert. There was a heartfelt need, that farmers are wrongfully directed in solar water pumping industry. And there in the market, solar panels are available that won’t last beyond 5years. Therefore Ii thought I should at least try to make you aware how Solar Works. Hope i have succeeded in bringing some important facts to your attention. Please comment so that i can learn more about the issues that you may be facing. INR. 5000/- for CII- Non-Members, INR.4000 for CII-Members, INR.3500 for SMEs , INR. 3000- for Institutions! World over, renewable energy is assuming tremendous importance.India is making rapid inroads in adopting renewable energy technologies. To further enhance the adoption of renewable energy and promote the private sector participation in this sector. To bring together leaders in the fields of technology, policy, industry, and finance to create a profitable platform for High level Networking and Business development in the renewable energy sector. This is expected to give a tremendous fillip to the low carbon growth of Indian economy.